South Korea and the US began on Sunday the annual joint military exercise Foal Eagle that has been earlier postponed due to the Winter Olympic Games in South Korea, media reported. According to the Yonhap news agency, the duration of the drills has been reduced to four weeks due to the alleged thaw in the relations between Seoul and Pyongyang. 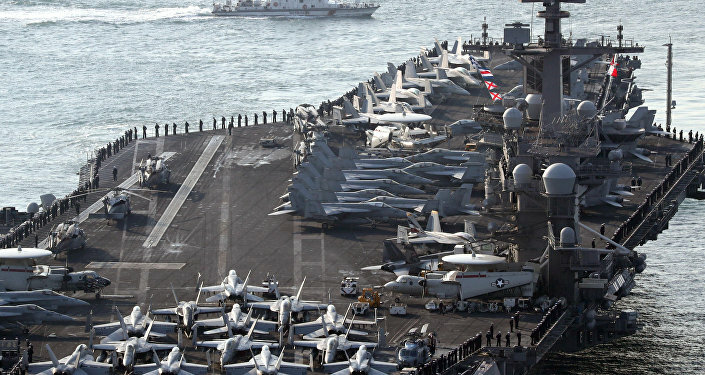 Moreover, US supercarriers or nuclear submarines were not deployed to the military exercise. The deployment of such powerful vessels at past drills has reportedly drawn angry responses from the DPRK officials. Meanwhile, a total of almost 300,000 South Korean servicemen and about 23,000 US troops reportedly taking part in joint Foal Eagle maneuvers. Pyongyang, which has earlier slammed both Seoul and Washington for 'practising invading' DPRK during military drills, this time has not commented the issue. Tension around Korean peninsula has reportedly shown signs of easing in recent weeks after North Korean leader Kim Jong Un has confirmed commitment to the inter-Korean talks and summits with US and Japan. The joint military drills come almost a month ahead of an April 27 summit between Seoul and Pyongyang. Kim Jong Un and South Korean President Moon Jae-in are reportedly expected to discuss denuclearization of the Korean peninsula and improvement of the relations at the upcoming summit.